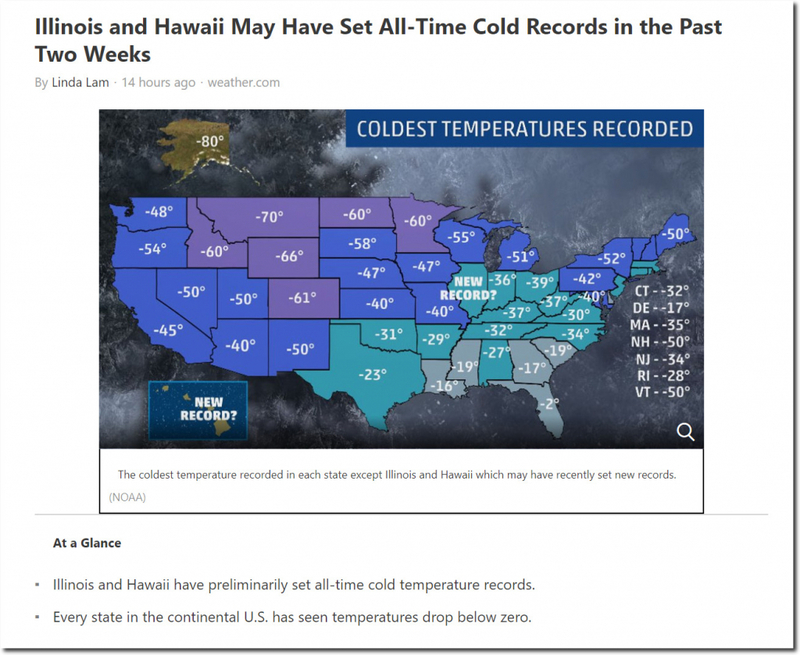 Illinois and Hawaii set their all-time cold records the past two weeks. This was caused by a 0.0001 mole fraction increase in CO2, which is overheating the atmosphere and will burn us all up in the next twelve years – unless we implement immediate global communism. 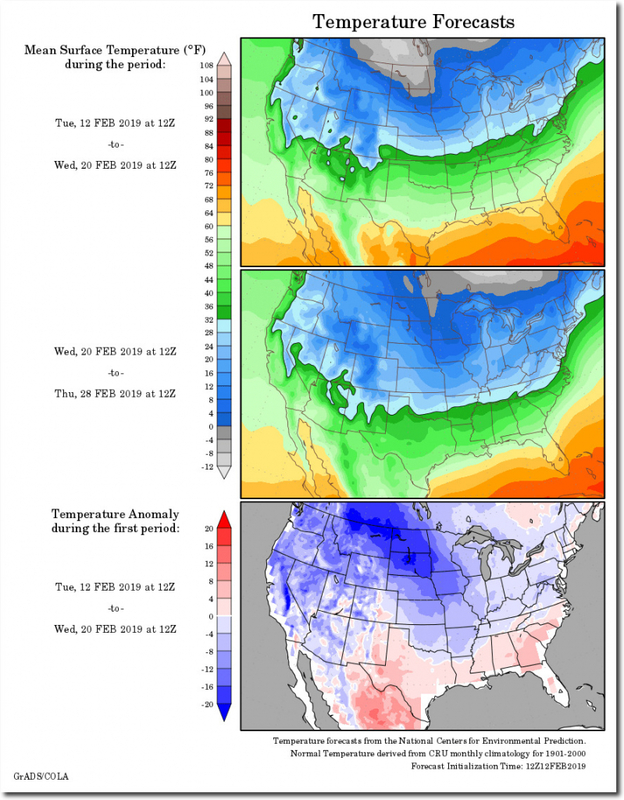 10-Day Temperature Outlook for the Conterminous U.S.
Great Lakes continue to ice over…hottest year in history of Solar System. Looks like the end of the lake effect season for lakes Erie and most of Ontario at least. Huron and Michigan are another matter but I bet they will soon follow. Scott Adams “5 Points” challenge…How can we help? 1) The purported global warming signal lies entirely in the adjustments to the measured temperature record. 2) Amplification by water vapor is required for runaway scenario. You cannot find data on total precipital water on any significant time period anywhere. If so significant, should be easy to measure. Previous warming events did not lead to runaway. 3) Water vapor can manifest in a manner that produces a significant negative feedback, e.g., enhanced snow cover, increased ITCZ convection, increased low-lying cloud cover. The entire imputed effect of CO2 rise to date is countermanded by a 1 percentage point increase in global average cloud cover. 4) It’s not a conspiracy, it’s an emergent property of a system organized on self-selection, gatekeeping, and funding (hence, career advancement) allocated to those who toe the line. 97% of Bigfoot researchers believe in Bigfoot. 5) Behind-the-scenes behavior of climate scientists. Hide the decline. Get rid of the blip. Beat the crap out of him. Delete emails. It might be a trap. A common theme of Adams is that advocates presenting you a list of disparate causes should be discounted. If it’s wrong, you should be able to point at one specific defensible reason why. I would refine Adams idea. The problem can be decomposed along at least three axes: science, self-interest, and ideological interest. The best argument against the science (manipulated records), self-interest (you don’t survive if you don’t toe the line), and ideological (you don’t enter the field if you think nothing is wrong with the climate). There will inevitably be some crazies offering up ideas and it may be that he will just selectively offer these as representing all non-believers. A favorite trick of the BBC is to provide “balance” by getting someone famous and prestigious on their preferred side and an incoherent nut-job on the other. Perhaps “trap” is the wrong word. I trust Scott is approaching this honestly. I should have said it is a potential source of criticism to provide a laundry list. Chuckled for a full 5 minutes on that one. 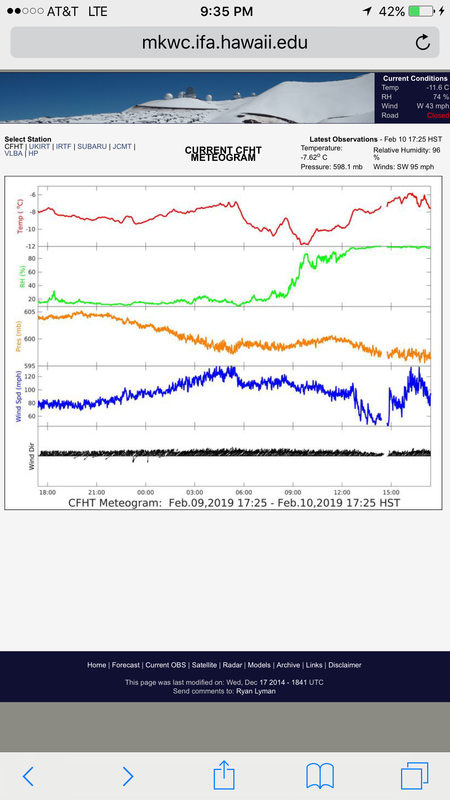 This is a screenshot of the Mauna Kea Weather Center data before it went offline perhaps due to that 190mph wind gust on the summit . I’ve been hoping to grow happier tropical fruit at my elevation at 2,600′ . Doesn’t look like that’s going to happen any year soon ! That blue on the model is coming even further south in the most recent operational runs. Going to reach right down to almost the Georgia-Florida state line. Just like Joe Bastardi forecasts months ago. tbh- i am really surprised that the arctic isn’ t running out of steam. I really expected after all the record cold in north america for a long period that there is not so much cold weather left for Europe and that we get some significantly warmer weather,but it is not happening. But i still expect a significantly warmer period to happen here before winter ends and that the climate hyenas will instantly missuse those days as prove for global warming and a huge propaganda campaign after they ignored the cold weather for month as much as they could. will manage to fix this winter and turn it into the warmest ever. The amount of lies and corrupption and adjustments will break all records global warming failed to break.